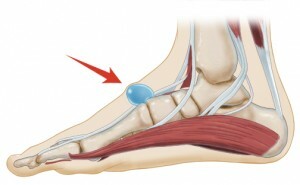 Ganglion cysts of the foot are benign, fluid-filled, soft-tissue masses that attach to tendon sheaths or joint capsules. The fluid tends to be thick, sticky, clear, and jelly-like. It is similar to synovial fluid, which lubricates the joints and tendons. Most ganglion cysts appear on the wrist, but a significant number also occur in the foot, usually on the top. The term ganglion means “knot,” which describes these irregular, multi-walled, mobile masses underneath the skin. The most distinguishing feature of ganglions is their location around joints and tendons, although in rare cases they may found in bones or tendons. The development of ganglion cysts may be rapid, or it may occur over many years. Ganglion cysts of the foot may shrink, enlarge, or even disappear and reappear. The majority of them disappear within two years. Although not generally painful themselves, ganglion cysts may cause symptoms due to their proximity to other structures. These cysts can be found in any age group, and women are three times more likely than men to suffer from them. Ganglion cysts are often painless and harmless, but as with any growth, you should have yours checked by your physician to rule out more serious issues. Why Do I Have a Ganglion Cyst on My Foot? The exact cause of ganglion cysts is still unknown. The most prevalent theory involves trauma to the affected area, which may result from a single, direct incident or from chronic overuse. This results in inflammation of the associated connective tissues, which then degenerate or liquefy into “ganglionic jelly.” The remaining connective tissue forms the cystic capsule to enclose this fluid, thus creating the ganglion cyst. Your doctor will ask about the history of the lump and perform a physical exam. The diagnosis may be based on appearance and feel. Sometimes a light shone through the lump can indicate whether the fluid is more liquid or solid, which further helps with the diagnosis. Additional testing may include analysis of the ganglionic fluid, x-rays and/or ultrasound. The x-rays and ultrasound may show damage to surrounding structures (tendons, joints, bones, etc. ); furthermore, the ultrasound is often diagnostic for ganglions. Should these tests be inconclusive, an MRI may be ordered. Once diagnosed, a treatment plan can be created. Treatment of the ganglion is dependent on the symptoms you are experiencing. If you are not in pain and the cyst is small, your doctor may prefer merely to monitor the situation. If there is pain, limitation of motion, or difficulty wearing shoes, however, some treatment may be necessary. The simplest form of treatment is aspiration (or drainage) of the ganglion. Usually the area is numbed with local anesthetic, after which a large-gauge needle is introduced to remove the fluid. Often a corticosteroid, and sometimes Hyalauroindase (a dissolving enzyme), is injected after the drainage to reduce the likelihood of recurrence. While aspiration is immediately curative, ganglion cysts do have a high rate of recurrence. If the aspiration technique doesn’t work, surgery may be performed to excise the cyst. Depending on the size and location, this procedure may be done in the office or the hospital. It requires local anesthesia, sutures, bandaging, and possibly splinting, again depending on the size and location of the cyst. Post-operatively, rest and reduction of activities may be required. The benefit of the excision procedure is that it has a significantly higher success rate in preventing recurrence, although complications such as joint stiffness, scar formation, and infection are possible. Home remedies seem to have little effect on ganglion cysts. Heat may reduce the size of the cyst, but only temporarily. Many home remedies can cause more harm than good, such as “Bible Therapy,” which involves taking a heavy object such as a book and smashing the cyst. Needless to say, such therapy can create complications. What Are the Risks of Ganglion Cysts? Are there any home treatments I can use? Is there any way to prevent scar formation if the cyst is surgically removed? If my cyst is surgically removed, will you be the one performing the surgery? Can ganglion cysts of the foot be prevented?